In this article we profile the Personal Training templates that are most useful in each area of a Personal Training business. Using proven templates within your Personal Training business gives you a competitive advantage and enables you to consistently out market, out sell and out perform your competition. Templates that have been proven to work over time will give you the best result and save you effort and money. Personal Training templates are a 'no-brainer' for the aspiring Personal Trainer as they eliminate risk, streamline processes and rapidly produce results. The best way to think of templates is as a 'short-cut'. They are simply a quick way to achieve a lot. You want to choose short-cuts that get you where you want to go, don't have any surprises and are easy to use. Templates are especially useful if they come with instructions on how EXACTLY you should use them. After all, a short cut is even better with a map! What templates will you need as a Personal Trainer? You can group the templates you'll need as a Personal Trainer into five areas; marketing, sales, training delivery, business planning, business administration. Understanding that templates and forms are different is important as well. Forms are structures (web, email, print) that you collect information into for you to use. If you want to know more about forms read this page. 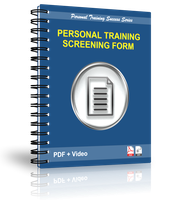 If you'd like to claim your copy of our custom designed Personal Training Screening Form you can download it here. Back to templates. Below is a list of Personal Training templates that you should think about getting. We've also written a little about what each template is used for. Promotional letters These are a motive based series letters or emails that are used with people downloading or requesting reports or tip sheets of certain types. They build credibility around a topic area, develop your position as an authority and make irresistible offers of a complimentary consultation or warrant of fitness or training review etc. Reports / tip sheets Motive based tip sheets and reports which answer questions a particular niche has and develop credibility for you as a Personal Trainer. 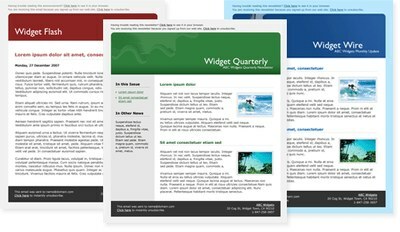 Often used as part of a drop-box offer, email campaign or within newsletters. Email auto-responders Similar to the letters but sent automatically via the web when someone gives you their email to receive a piece of information (report or tip sheet) in an area of their interest. Very useful and low effort creating consistent interest - particularly useful within a club setting. Email campaigns One-off campaigns often conducted at certain times of year targeting a niche of clients with a series of content and an offer of engagement. Call scripts Scripts for standard types of calls; non-attender calls, new members calls, birthday calls, one week / month or half way membership calls, end of a bootcamp or 8-12 week challenge call etc. Posters Stimulating interest in an offer of motive based content such as a report or tip sheet often used with text response for ease. Referral content programme A series of offers and reminders that is placed within client contact materials to stimulate referral. Profile cards A display marketing piece helping the client get to know you, showing you understand clients in your niche and making an offer of information or a complimentary consultation. Member survey Getting in touch with members and finding out their views of their fitness progress and preferences. Extremely useful as a lead generating tool and having both print versions for in-club use and web/email templates for contacting members who are not attending is ideal. Welcome pack Creating significance for new clients by giving them tangibles to take home including copies of their fitness information, consultation documents, agreements, the months newsletters, details of your referral programme, tip sheets on items related to their needs etc. No sale return follow up series Following up with potential clients who didn't commit to training thanking them for their time with you, giving them important information relating to their training and encouraging future contact. Resistance programming Prescribing resistance training workouts including creating expectations for progressions, managing intensity and duration and recording attendance. Recipes Provision of options for clients based on their tastes and ensuring all options are easy/quick to prepare and healthy. Daily menu examples Examples of tasty menus for various caloric intakes as examples. Weekly menu template A weekly menu template that can have meals and snacks populated based on the clients preferences and the nutritional guidelines. Results report template Giving the client their fitness results in a visual and easy to understand report structure that they can use to let others know how they are going. Email / letter client support Congratulatory and supportive a series of letters that can be used at any juncture where the client is making progress, needing a pick-me-up or has achieved a particular result. Financial calculator Calculating the financials within a Personal Training business including analyzing the lead generating needs of the business. You can claim your free copy of our PT Financial Calculator here - PTs worldwide use it to map and improve their business's financial performance and it's super-easy to use of course! Business plan template Setting crystal clear goals for the Personal Trainer, defining the 'pay-offs' to the Personal Trainer and creating a short-term action plan for the business. You can claim your free copy of our PT comprehensive business planning template here - PTs from every hemisphere are using this very template to quickly and comprehensively plan and execute business improvements year on year. Business performance analyser Taking a detailed look at each area of the Personal Training business in order to optimise financial performance and identify areas to work on that will make the most difference in the business. Monthly action plan Setting clear monthly goals and step by step actions within particular areas of the business to maximise results. Cashbook template Tracking income and expenses on a weekly basis for the business allowing for bank statement reconcilliation. Weekly - monthly checklist Keeping track of standard repeating tasks that must occur in the business for it to run efficiently and profitably. Price rise template Letting clients know of an upcoming increase in pricing whilst giving them the opportunity to secure a number of sessions at the current price in advance. Often a sticky area, so very useful to have the proven template here. Why would you use these Personal Trainer Templates? The templates listed above are all designed to optimise your results using as little time, money and effort as possible. As such, you'd want to have all of them in your hands if you could and at the very least to start out you should have the templates relating to prescribing for your clients (that is, the resistance training and cardiovascular training templates). Accepting that almost all Personal Trainers will get some clients and get the opportunity to deliver quality to these clients the cardiovascular and resistance training templates are a must. You can claim your copies of these templates here as a free download including video instructions on how to use them showing you why they are designed exactly the way they are and why they work so well. The templates for marketing, sales and business administration are also hugely valuable particularly where they have been professionally designed and tested within the industry. The business planning template we recommend is by far the best Personal Training business planning template we have come across for club-based Personal Trainers. How can you use Personal Training Templates to improve your PT Business? The key to progressing your business by using templates is to focus on the area of your business that needs the most work first and forget the rest for now. Try not to get bogged down with chasing all the templates at once. Rather, work out what area of your business needs the most work now, and secure a template and exact instructions to help tweak that area alone. To analyze your business and what areas need immediate attention you can use our customised PT financial calculator. You might also like to review this video analysis of four PT businesses where you'll quickly learn how to analyze a Personal Training business by looking at some key numbers.